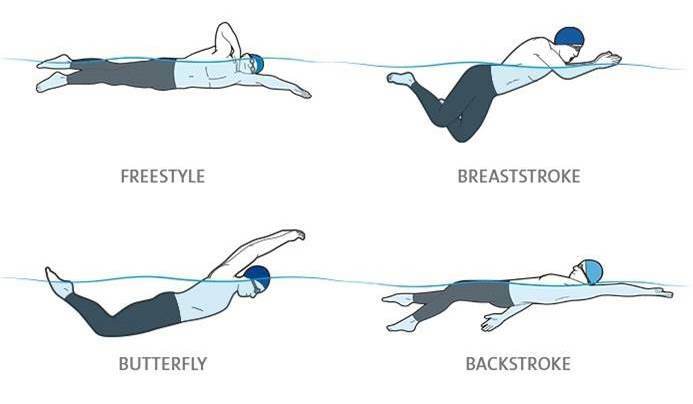 There are 4 styles used in swimming competitions. 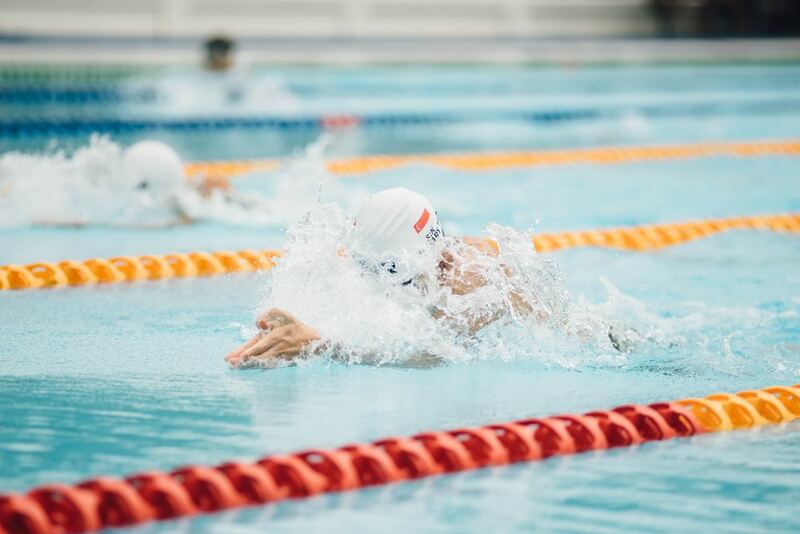 The most popular one is freestyle followed by backstroke, breaststroke and butterfly stroke, the latter being lesser known by the general population. Let’s see the differences between these styles and how to perform them correctly. This is also known as front crawl because it describes the action quite well. 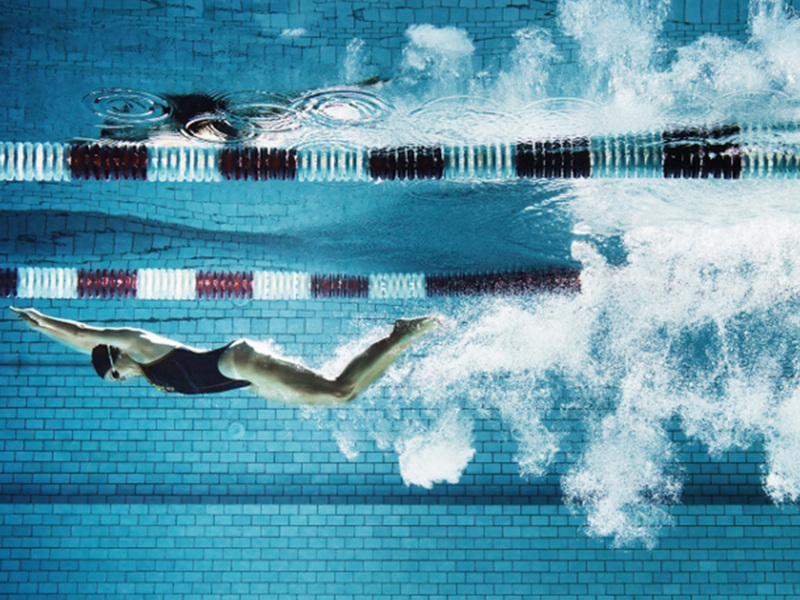 The swimmer uses alternating arm movements to advance while the legs do a flutter kick. It’s the easiest and the first stroke you learn if you take swimming lessons. It’s also the fastest one, being preferred by top Olympic swimmers. 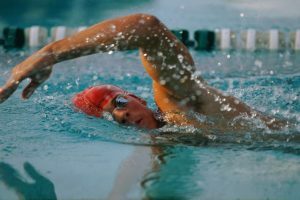 Triathlons use this stroke in their swimming parts precisely because of its speed and efficiency. This might be easier to learn than freestyle. The legs do a flutter kick just like in front crawl while the arms make an alternating circular movement to advance with your face always above the water. You could call it a back crawl if you like, because that’s basically what you’re doing. This stroke is the 3rd in terms of speed and is actually recommended for people with back problems because it gives an excellent workout. Women tend to prefer backstroke because it’s less physically demanding than let’s say, butterfly or front crawl. Some teachers prefer to teach beginners this stroke first as opposed to freestyle. In fact, casual swimmers are actually swimming it without knowing how it’s called. 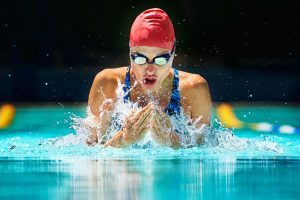 The advantage for beginners is that they can keep their head above water, even though in pro breaststroke swimming, you keep your head below the water as much as possible because you waste precious time going above it to breathe. 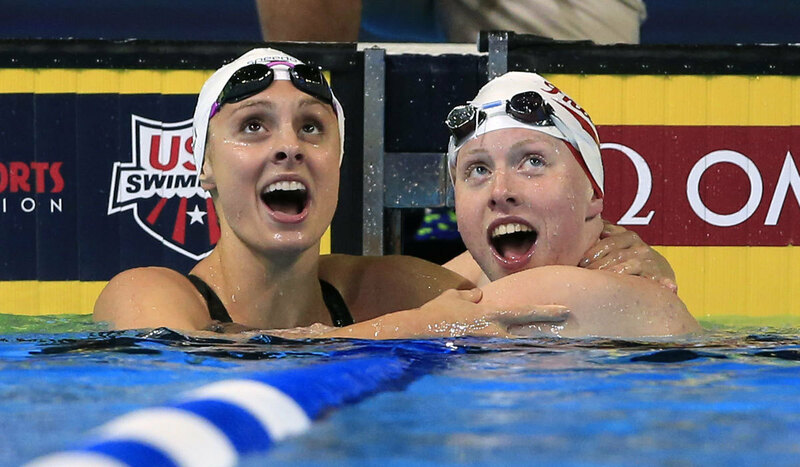 Breaststroke is the slowest of the competitive styles. You are doing short synchronous half-circular movement underwater with your arms and a whip kick with your legs. Some argue that breaststroke is quite similar to how a frog swims. This is the most physically demanding style, thus being preferred by men. If you lack training, you won’t be able to swim more than 15m like this. Instead of moving your arms alternatively, you move them both at once while making a dolphin kick with your legs and a wave-like body ondulation. It’s quite difficult to master and even more difficult to be fast when swimming it, which is why it’s usually the last stroke learned. 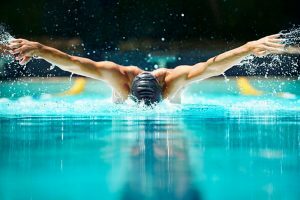 If you have the strength and stamina, butterfly is the second fastest stroke after freestyle in spite of leaving you exhausted. Body undulation matters a lot to gaining speed and so does the number of arm movements you make before taking your head out of the water for recovery. Michael Phelps illustrates this perfectly in the Olympics when he wins the gold medal several times.